Our city contains many details, sometimes curious trifles that impart a homeyness and simplicity to its “austere, comely look,” to a city that is sometimes uptight and business-like. 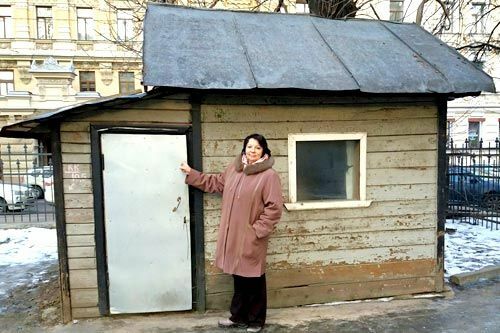 Among them was the tiny wooden house that stood for over sixty year at Lomonosov Street, 9, behind the fence next to the old entrance to the Refrigeration Industry Institute. This unpretentious hut, which resembled the huts you see nowadays on garden plots in the countryside outside the city, was partly a matter of pride to me, since it was a rare specimen of wooden construction in the heart of the city, and its designer was my granddad Ignaty Malakhovich Yerofeyev. Neither an architect nor even a carpenter, Ignaty was an ordinary caretaker. Ignaty and his family arrived in Leningrad in 1929 from the village of Gogolevka, Smolensk Region, having left behind the house he had built there. Physically strong, thrifty, and intelligent, he had got his family away from the collectivization campaign. In Leningrad, he took a job as a caretaker. At first, the family had to live in a basement. The family survived the Siege of Leningrad. Granddad remained at his job, while my father, who was fourteen years old in 1941, worked in a factory. Their peasant skills came in handy in the spring of 1942, when all the land in the institute’s yard was repurposed into vegetable gardens. Only after the war did the family get permission to move into an apartment on Lomonosov Street, 9, to which its former occupants had not returned. This house was my home, just like the yard, in which there were three whole gardens. The poplars growing in them were also planted by my granddad and his friend Grandpa Kostya, who had also arrived from Gogolevka during the year of the so-called Great Break (velikii perelom). Built by Ignaty Malakhovich in the early post-war years, the little house by the gate was the caretaker’s hut, which housed his scant collection of equipment. When I was born, Granddad was already retired, but he still really enjoyed relaxing on the bench he had placed next to the hut. In 1968, the institute’s residential building was resettled and enlarged, and the little garden were practically destroyed. The hut, which was all we ever called it, was vacant for several years. Later, it was turned into a gatehouse, before becoming a security checkpoint in the 1990s. It was slightly rebuilt. The porch was removed, and it was repainted from green to brown. Walking down Lomonosov Street, I always enjoyed looked at our family relic. The last time I passed through this familiar place, in April of this year, I was disappointed to see the old gatehouse was gone, replaced by a cheap-looking construction trailer. I entered my old yard. A security guard immediately emerged from the depths of the yard and demanded I leave the premises. When I asked him where the hut had gone, he replied, “It was taken away for restoration.” I didn’t believe it. Soon I repeated the same route and stopped by the yard again. The run-in with the guard was repeated, although another man was on duty. Surprisingly, he also said the hut had been taken away for restoration. “Can’t you see this is a temporary shed?” the security guard exclaimed angrily. His angry question was music to my ears. Oh, how wonderful it would be if Granddad’s hut were returned to its place.